With that disclaimer out of the way, I thought I would share my impressions on several of the more popular writing software available. These products are all under $50, and several are free. I’m aware there are products out there costing several hundred dollars; unless those really do create your plot and characters for you, I’m not sure that’s the best use of your money. I spent probably too much time playing with a number of different programs (it’s okay, I enjoy it). Below are the results of said procrastin—I mean research. For me, writing software ideally should offer, at a minimum, visualization of the story structure, organization tools and statistics/analytics. yWriter is free and developed by a single individual. Nevertheless, it has an elegant, professional design and more features than pricier options. yWriter isn’t colorful or flashy; most of its tools are located in drop-down menus. But the interface is very clean and straightforward, and the tools are easy to figure out. It isn’t perfect (more on that in a moment), but it provides 95% of what I was looking for (no choice provided 100%). Like most writing software, yWriter allows you to structure your story in chapters and scenes. The chapter list appears on the left side, compact enough to be able to view 30+ chapters at once. Click on a chapter, and the scene list appears on the right (with the text of the scene in the bottom half of the display). If you use descriptive titles for the scenes, it’s easy to see the flow of action in a chapter from the scene list. Importantly, you can reorder chapters and scenes at will, and easily move scenes between chapters. While a visual storyboard is one of yWriter’s few glaring weaknesses (it’s quite bad), the easy rearranging of scenes and chapters largely makes up for it. yWriter’s real strength, though, is the ability to embed multiple independent “tag” parameters in scenes. Each scene has a POV character; you can then add other characters appearing in a scene, the location(s) of a scene and multiple “Items.” Items are whatever you want them to be; I use them to track sub-plot arcs. You can add more details to each scene: the state of the draft, 4 measurements of your choosing on a 1-10 scale (I use Action, Tension, Science and Quality), date, time, duration and more. a graph of the flow of your 4 measurements over the course of the story, and more. Finally (though there are other features I haven’t touched on), it can quickly display any chapters you choose or the whole text in an ebook-like format so you can get a feel for how it looks and reads. You can also export the text to HTML, RTF, text and LaTeX. As I said, yWriter isn’t without flaws. The visual storyboard is virtually unusable. A few tools simply don’t work (notably, printing scene cards). The grammar tools occasionally bug out until you restart. But at a price of free, it is an impressively full-featured and polished program. Note: I still do my substantive writing in Word, then paste the text into each scene in yWriter—back to that ‘control’ principle from an earlier post. That being said, yWriter’s interface is more than acceptable to write in if you choose to do so. 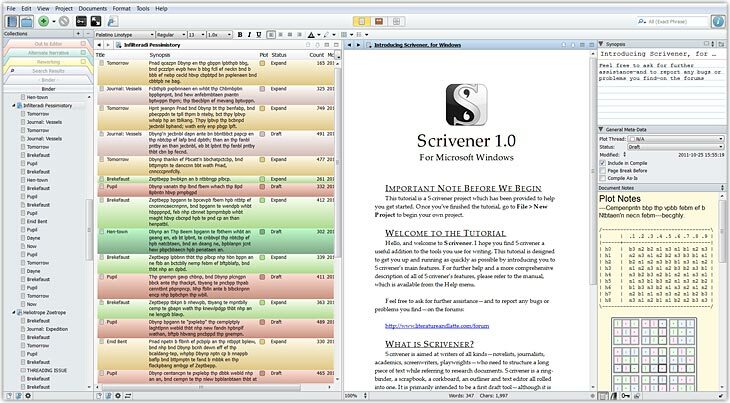 Scrivener is likely the most popular writing software around, and with good reason. It has a 30-day free trial, and I encourage you to try it out. It comes with an excellent corkboard/storyboard tool, an outline view and chapter/scene organization. It features a very robust “binder” tool which has a bit of a learning curve, but essentially allows you to associate scenes/ideas/notes/research together without affecting the text or core structure. Scrivener will display your writing in an ebook-like format, and will in fact format your story for publication. So why is it a runner-up and not the winner, for me? Well, for one, it costs $40. Now if you find its tools intuitive and get a lot out of it, this is not an unreasonable price for the features it offers. Still, not free. Second, its “tagging” capabilities are far more limited than yWriter. You can only tag a scene with two parameters…and you really can’t do anything with those tags. For me, Scrivener’s biggest weakness is the lack of analytics tools. I wasn’t looking for an attractive interface in which to write; I wanted a program which could tell me things about my writing—and Scrivener just doesn’t do that. Third—and this is likely peculiar to me—Scrivener’s “binder” tool could be quite handy for collecting and organizing research and background materials. However, I had already done most of my research and collected background materials before I started testing writing software; therefore, I had little need of the feature. If you’re starting from scratch on Day 1, Scrivener's binder very well may be an invaluable tool. Well, this section was going to be about “Storybook,” a full-featured writing program which offers most of its features for free ($40 for the full version). However, it appears the program’s website as well as all its social media pages have vanished from the internet. I have no knowledge as to why, but feel I shouldn’t recommend the program for the moment. WriteWayPro (30-day trial, $35): Probably the 3rd runner up in the survey. Good organization features, decent tagging and interesting graphing tools. Note: when I tested it, the demo was a “play with this sample” and did not allow saving of customized data, thus my ability to test it out was limited. That appears to have changed now with the addition of a full 30-day trial, so give it a try. Celtx (15-day trial, $15): Nice layout, friendly price-point, but geared far more toward script writing than novel writing, and most of the features reflect that. Writer’s Café (Limited demo, $40): Graphical-heavy interface; seemed to offer a decent number of organization tools and features (including a nice storyboard). In practice, I found it unintuitive and cluttered. StoryBlue (Limited trial, $30): Nice interface with some tagging tools; seemed to be short on features for the price compared to other offerings. Liquid Story Binder XE (30-day trial, $50): As a sucker for beautiful interfaces, I truly wanted to love this program. Yet even as a software engineer I was utterly unable to figure out how to actually use most of its professed features. A shame, really. StoryBox (45-day trial, $35): Very attractive interface, comparable or even superior to “distraction-free writing” software. Offers eBook formatting. No analytics or tagging features. NewNovelist (Online demo, $48): Okay, I admit, I didn’t actually use this one. The demo is very limited and the price high. That being said, it appears to be a professional and full-featured product worth a look. This post didn’t focus on “grammar-checking” features, as writing software (strangely) isn’t strong in that area. Of the programs discussed, yWriter has the most grammar tools, with a “word usage” chart for scenes and a search function for common “problem” words (-ing, -ly, ‘suddenly,’ etc.). EditMinion: The interface is circa 1995, but it does a good job of identifying straightforward problems (adverb overuse, preposition-ending sentences, passive voice, etc.). ProWritingAid: Excellent tool which identifies a number of grammatical and stylistic issues, as well as items your attention should be drawn to (if you meant “some” that’s cool, but if you used it 17 times in 10 pages, you should be aware it’s a “vague” term and might want to consider being more specific when you can). SlickWrite: Attractive interface, with a solid adverb/passive voice/etc. check. It has a terrific “repeated phrases” feature which will pick up 3-, 4-, 5- and even 6-word phrases you’ve used more than once (no, I’ve never used a 6-word phrase twice in a scene…oops). Also, the “flow” graphs are just lovely. Grammerly is a very well-regarded grammar tool which is far from free ($30/month or $140/year). It does have a 7-day free trial, which I took advantage of. Personally, I found it of limited utility (it had suggestions, but they were generally either inapplicable or matters I had already considered and had a reason for disregarding). In fairness though, I ran scenes through it last, after I had edited using the above tools. If I had utilized it first, it might have been more helpful. SmartEdit is another well-regarded tool. It has a 10-day trial and a slightly less nosebleed-inducing $50 price tag. When I have a solid draft of the entire novel, I intend to take advantage of the 10-day trial; if it proves itself helpful, it may be worthy of the purchase price.